Milwaukee was coming off a disappointing 68-94 season in 2003, and most prognosticators were calling for the team to finish with a similar record. Even with a relatively new leadership tandem in General Manager Doug Melvin and Manager Ned Yost, the franchise was in limbo, having been put up for sale by Bud Selig’s family. Melvin didn’t have much money to work with in fielding a team, as the Brewers had the lowest payroll out of all 30 major league clubs at $27,518,000. Due to the cash constraints, Ben Sheets was the most recognizable name of the 22 different players that pitched in 2004 for the Brewers. Sheets was the opening day starter on April 5, and he was followed in the rotation by Doug Davis, Matt Kinney, Chris Capuano, and Wes Obermueller. By the time the team was making its third turn through the rotation, two things happened that would help Sáenz make his unlikely jump to the majors from AA ball. On Saturday, April 17, the Houston Astros went ballistic on Milwaukee pitching en route to a 14-5 victory. Matt Kinney only lasted three innings and Ned Yost was forced to use five pitchers afterward, including utility player Trent Durrington. The next day wasn’t much better for the pitching staff, as starter Chris Capuano strained his right quadriceps muscle and gave Yost just two innings. Yost called Wes Obermueller into the game for long relief even though he usually followed Capuano in the rotation. Three relievers came in after Obermueller as Roger Clemens and the Astros emerged victorious 6-1. The Brewers started a home stand against Arizona after the Houston series, and while it started out with a 4-2 win, Yost still used four pitchers. The next two games tipped the scales, however, and put Yost in a desperate situation. In a 10-6 win, again four pitchers were used. A 15 inning marathon loss followed, capped by Adrian Hernandez throwing the final five innings just to give the other pitchers a break. In the meantime Capuano had been placed on the disabled list retroactive to April 19, which made him eligible to return on May 4. Milwaukee continued their home stand over the weekend with powerhouse St. Louis followed by a much needed off day on Monday. Looking ahead, the following Monday was also an off day and Cappy would be coming off the DL. Yost pondered his options, knowing that a spot starter might be able to get his rotation back in line, and allow some of his arms to get a short break. Rather than use an option to call up one of the AAA Indianapolis starters, Yost looked at the AA Huntsville Stars staff for help. Having started five days earlier, Chris Sáenz lined up perfectly to start on Saturday, April 24, for the big league Brewers. He was coming off a 14-5 win and had a 1-1 record with a 3.86 ERA to that point. Sáenz said goodbye to his teammates, including a young slugger named Prince Fielder, and caught a flight to Milwaukee to join his new team. Sáenz was born in Tucson, Arizona, on August 14, 1981, making him 22 years old at the time. He graduated from Tucson High School and stayed to attend Pima Community College. 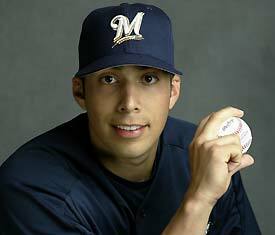 Sáenz caught the attention of the Brewers and the team drafted him in the 28th round of the 2001 amateur draft. But the biggest name on the draft board was J.J. Hardy, who would arrive in Milwaukee in 2005. Sáenz started his minor league stint in Ogden of the rookie Pioneer League shortly after the draft. The following year he arrived in Wisconsin, pitching in relief for the Class A Beloit Snappers. He posted a respectable 3.51 ERA over 74.1 innings and proved to be a strikeout pitcher with 99 K’s. In 2003 he split time between High Desert (an A+ level team) and Huntsville. In High Desert he converted to starting games only, but as a result his ERA ballooned to 5.20 in 26 games. Yet his strikeout ratio to innings pitched was still over 1:1, as he fanned 136 in 128 innings. 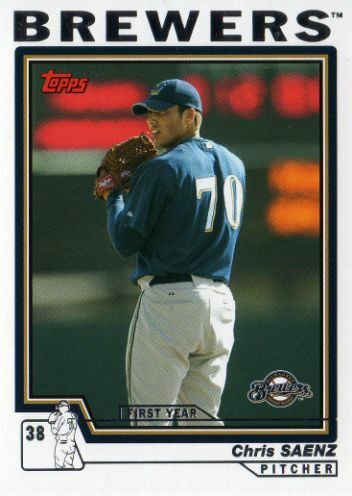 Going into 2004 the Brewers had hopes of Sáenz lowering his ERA and perhaps making the jump to AAA the following season. But on April 24 that season he was a major leaguer wearing No. 38, taking the hill against the Cardinals and Woody Williams. The Cardinals #3 starter posted an 18-9 record and appeared in the All-Star game the previous season. In the top of the first inning the right-handed Sáenz faced Bo Hart, Ray Lankford, and Albert Pujols. Sáenz got Hart to go down swinging on a slider, but then got into trouble by loading the bases with a single to Lankford and walks to Jim Edmonds and Scott Rolen. With two outs (Pujols had popped out in foul territory), Edgar Renteria hit a fly ball to deep center field that Scott Podsednik hauled in while nearly crashing into left fielder Geoff Jenkins. It was the closest the tough Cardinals lineup would get toward scoring anything off Sáenz over the course of six plus innings. St. Louis came into the game leading the NL with a .294 batting average and led the majors with 34 homers on the way to a 105 win season and an eventual loss in the World Series to Boston. Milwaukee would again end up at the bottom of the Central division with a 67-94 record. Milwaukee only managed three hits off Williams on the day, but scored two runs in the bottom of the first inning, which proved to be enough for a 3-1 win. Both teams were hovering around .500, but the Brewers clearly had the Cardinals number. It was their fifth win in six meetings on the young season. Sáenz allowed just three base runners after the first inning. He hit Pujols with a pitch in the third inning and gave up a single to him in the sixth. After a walk to Renteria to start off the seventh inning, Sáenz was lifted in favor of reliever Jeff Bennett. The Brewers bullpen kept the Cardinals in check the rest of the way, capped off with Danny Kolb’s fifth save. Sáenz became the first Brewer to win his big league debut since Nick Neugebauer in 2001, and would be the last until Yovani Gallardo won his debut start in 2007. He threw 93 pitches on the day, 58 for strikes – and he struck out seven Cardinals – including Mike Matheny, Reggie Sanders, and Scott Rolen. Sáenz had two at bats of his own, but struck out and ground out. The 22,222 fans in attendance at Miller Park wondered if they’d see Sáenz make at least one more turn in the rotation before being sent back to the minors. His temporary teammates, including Geoff Jenkins, wondered the same thing. Yost told the Milwaukee press that he’d be making a plan for the coming week of starts while acknowledging Sáenz’s performance. “What he did out there today…that’s phenomenal,” Yost said. It’s completely possible that Sáenz may not have started the game at all. He was in the bullpen the night before his start as “emergency relief” if needed, and if he had come into the game he wouldn’t have been the name to replace TBD in the rotation. Yost easily could have gone the same route, keeping Sáenz around for an extra bullpen arm until Capuano returned from the DL. Instead, Sáenz got a ticket back to Huntsville just two days later. Victor Santos was recalled from Indianapolis to take his place, pitching out of the bullpen at first, and later moving into the rotation. Sáenz pitched for the Stars through the summer, but suffered an elbow injury, and underwent Tommy John surgery in September. He only started 14 games that season for Huntsville, going 5-5 with a 4.15 ERA in 84.1 innings. The timing for Sáenz’s injury couldn’t have been worse. It was the final year of his contract, so the Brewers simply non-tendered him, which brought on free agency. He did re-sign with the team and attempted a comeback, but wound up sitting out all of 2005 and 2006. Milwaukee finally cut ties with Sáenz, and he signed with the Los Angeles Angels of Anaheim for 2007. Sáenz found himself back on the hill with the AA Arkansas Travelers that season, but he couldn’t find a groove. He went 1-7 with Arkansas and turned in an 8.41 ERA and just 24 strikeouts against 31 walks in 46 innings. The Angels released him and he caught on with the independent Reno Silver Fox of the Golden Baseball League. Unfortunately Reno was no kinder to Sáenz, and he again compiled an ERA over 8.00 in 26 innings of work. Sáenz made one final attempt to get back on track with the Schaumburg Flyers of the Northern League in 2008, but struggled to the tune of an 8.42 ERA in 25.2 innings. At age 26, he called it a career. Chris Sáenz is proof that sometimes the best results come from sticking to what works – no matter what the situation or opposition. Good article, I remember listening to that game Saenz pitched. It was quite exciting thinking the Brewers had a good young pitcher coming up the ranks. Small correction, I only bring it up because it’s another interesting bit of Brewers trivia, but the Danny Kolb that saved 60 games for the Brewers in 2003-2004 was not the same Dan Kolb that was drafted by the Brewers in the 2001 draft… oddly enough the Brewers had both of them in the system at the same time. Danny, the closer, was drafted by the Rangers in 1995 and made it to the majors with them before coming to the Brewers as a free agent. Dan, the minor leaguer, only made it to high A ball with the Brewers organization before moving on to the Nationals system and topping out at AAA in 2007. Thanks for pointing that out about Dan Kolb. I removed the line about him being in the same draft from the post. Glad you liked it – thanks!